From our FIRMATO collection we are happy to offer for sale our Firmato stainless steel two tone bracelet. Crafted from high quality 316L stainless steel which has links that are both high polish and links with a brushed finish, giving the bracelet its beautiful two tone appearance. With the use of stainless steel you can rest assured the bracelet will not fade or tarnish now or many years in the future, due to its composition it is known to retain its shine for years and years. 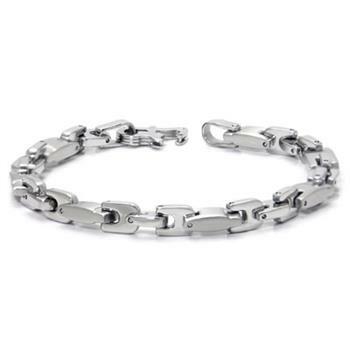 Our stainless steel jewelry bracelets and other jewelry, such as the FIRMATO stainless steel bracelet are perfect choices to purchase as a gift or present. The reasons why are many. Firstly stainless steel is very strong and as such does not break easily as is often seen with bracelets made of expensive precious metals. Next value, the precious metals silver, gold, and platinum not only look great butll will tarnish and have a huge price tag, where our stainless steel bracelet will look great forever and cost just a fraction of those made of silver, gold, or platinum. I bought this bracelet for my fiance to match the necklace we had picked out together. They look amazing together and he loves both pieces of jewelry. Wanted to take a minute to thank you for your speedy delivery of my bracelet. It arrived in a timely manner after several notifications from you. The quality is amazing for the price. Keeping in touch during the process helps ease the concerns of ordering on-line. Thanks so much. I picked this one as my first choice and then another <>My son was soooooooooo happy on Christmas Morning when he opened both gifts. Absotutely Beautiful~!! I was very happy 2x. The Firmato SS Two-tone bracelet looks great on my wrist. The clasp is easy to close with one hand also. That's a plus for any bracelet.